The NHS is run by a number of regional Trusts, who all operate individually, so they each have their own regional focus and different funding opportunities. People are at the centre of the systems in which the NHS operates – each clinical pathway will be different, depending on the patient – not everything can be automated or planned and one size does not fit all. Bolton Foundation NHS Trust start with asking the clinicians what they need, rather than opting for the newest tech – in this way they provide something which meets their needs in a practical way - user-centred designs are key. Artificial intelligence is assisting with electronic observations, or Eobs, to feed information directly into records and issue alerts automatically. Bolton Foundation NHS Trust have linked up the patient entertainment system with the new Wi-Fi initiative, allowing patients to bring and use their own devices. NHS Digital will be releasing an app to keep users connected to their health record and information via their own devices. Phillipa Winter: You know we're not talking about tins of beans, we are talking about people who have multi comorbidities, so you can’t always use the same pathway, because somebody could be quite different, so what you might need could be very different to James and Brett’s needs because of what you’ve got in your health. Brett Walmsley: You open your laptop today, if it took ten minutes to log on it would be an inconvenience. If that was a consultant that had to wait ten, fifteen minutes, that’s a patient he’s not seen. That’s what you’ve got to think about when it’s citizen, patient friendly. 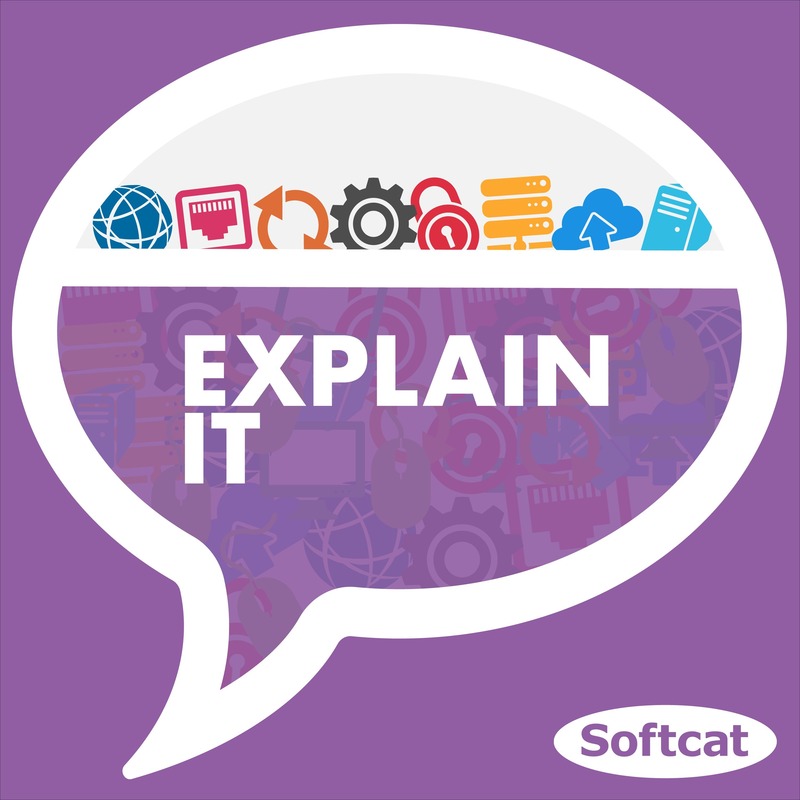 Michael Bird: Hello and welcome to Explain IT brought you by Softcat; the show for IT professionals by IT professionals that aims to simplify the complex and often over complicated bits of Enterprise IT without compromising on detail. I'm host Michael Bird and over the next 20 or so minutes I'll be challenging our panel of experts to take a different area of the IT ecosystem and of course, Explain IT. And in this episode we’re going to be taking a look at the future of IT in healthcare. And with me to help today is James Seaman who is Softcat’s account chief technologist for healthcare. James, I asked you to bring along an interesting fact - what is your interesting fact? James Seaman: I worked and lived in Sierra Leone. Michael Bird: Wow, whereabouts in Sierra Leone? James Seaman: In a couple of different places I worked for mining project. Michael Bird: We also found Phillipa Winter who is CIO at Bolton Foundation NHS Trust. Phillipa what is your interesting fact? Phillipa Winter: Originally in my past life, I'm an occupational therapist, and I was a clinical specialist in hand injuries and I was well known because I used to teach splinting and make some really unusual splints so I was well known as ‘Winter the splinter’. Michael Bird: We also have Brett Walmsley who is CTO also at Bolton Foundation NHS Trust. Brett what is your interesting fact? Brett Walmsley: So in my spare time I do sugar craft - cakes. Michael Bird: Wow, explain to me what a sugar craft cake is. Brett Walmsley: Think more Cake Boss and less Bake Off. So there are more like models - so I spend days and weeks creating these things. For example I did a wedding cake for a friend that was half a seven tier wedding cake and half Lego Batman. Michael Bird: What was your most impressive creation, Brett? Brett Walmsley: Probably that one because I got to play with LEDs as well. Michael Bird: Today we're going to be talking about the future of IT in healthcare. So let's start off by doing a brief history lesson of the NHS and maybe a bit of explanation about how the NHS is structured, where the funding comes from, that kind of thing. James? James Seaman: The NHS is recently just over 70 years old, it was July 1948 that Aneurin Bevan started the NHS and the first NHS site in 1948 was actually in Manchester and it's grown to something that I'm immensely proud of and obviously England, Wales, Scotland, Northern Ireland care is free at the point of delivery. It is the biggest employer in the United Kingdom and probably the biggest asset to living in the United Kingdom is that you are guaranteed healthcare. Michael Bird: Can you talk a bit about where technology first appeared in the NHS and maybe a brief explanation about where it is today? James Seaman: Technology inception in the NHS was obviously clinically led. So labs, imaging, x-ray, radiology had a massive impact in innovation for IT and drove the first core requirements for IT services and then there’s the consumer type of IT so your desk based services matured, there was innovation and opportunity identified to help add further efficiencies, so if you think of a GP sitting and talking to you and writing notes in a pad, to actually being able to access your clinical record, obviously desktop based services and applications and then we find ourselves in the position today where you can get pathology results back in a matter of hours. Michael Bird: Phillipa can you explain the structure of the NHS? Phillipa Winter: Fundamentally we are governed by the government and that in itself comes from NHS England as the main national body that provides us with funding and directives and policies. That then breaks down to more of a digital department, which is NHS Digital and then from that point of view you might have heard of Monitor when all went in to turn around in 2012, is now called NHSI which is NHS Improvement, so that's around how we manage our cost improvement programmes, how we can use lean methodology and technology to change our workforce. So that's the government direction and policy, we've got a new health minister in Matt Hancock who's very technology driven and has got his own advisory board. So then you think more regionally we have STPs, sustainability and transformation plan - used to be partnership - and then you've got your locality and the CCG, Clinical Commissioning Group, and they are actually, within this government, probably going to change under the local care organisations and local care partnerships where we bring health and social care together and there will be a commissioning arm which will be inclusive of local authority and then a provider arm. Michael Bird: So rather complicated, the structure, however you look at it. Phillipa Winter: So we talk about primary care, so for people out there, your primary care is their GP practices and the services that are wrapped around there. We've got secondary care which is your acute hospitals and provision within hospitals and services, maybe outpatients that are linked to that, and then you've got your tertiary care which are your super centres that provide specialist services like heart surgery or specialist children hospitals. So you've got the different levels in that way but also a Trust, as we talk about Trusts, they can be made up of many different ways, so Bolton we are an acute and a community Trust and if you link that to the local care organisation, we want to reduce the footprint of the hospital, we want to treat more people out in the community, we want to prevent ill health so that only really the people in hospital need to be there because they're really sick. But it's also around that prevention model, but also that monitoring, so if we've got more staff and services around the primary care that we can prevent people coming into hospital that's the absolute key. Michael Bird: So how is the Bolton Foundation NHS Trust funded, where does that money come from? Phillipa Winter: You’ve got the government which gives out the funding and we get funding in many different ways. So there's your standard funding which just keeps the light on and does your business as usual and that gets devolved to Greater Manchester and that then goes to the CCGs, so the CCG in Bolton then provides commissioned services from the Trust to provide all those different services and there’s a cost for that, but on top of that there is other ways that we can source funding through NHSI, through different digital bids whether that's through Greater Manchester or that’s national or technical bids or other bids that are linking to health - population health and other initiatives out there from NHS England so there is other funding sources but the business as usual money comes via and directed through this Clinical Commissioning Groups. James Seaman: The rest of the money is where that competitive edge comes in. You need to bid for that money. The agenda is set centrally, so population health or local health care record exemplar programmes, things like that, so there’s a lot of talk around LHCRE bids, they are competitive, they are regionally competitive, so each region has to put a case together to release that funding. Phillipa Winter: But where I think people don't realise in the public sector now that things are changing is that there are tenders put out there and you can win and you can lose and that makes a difference to your overall income. So although we don't make a profit, we do have to win awards because that's what keeps us and keeps the lights on, so it's really important that we still have that competitive nature, that we do have to go out there and look. So locally for us we are looking at a certain tender and that you've got to do that bidding for that and whether you win or not and if not then that's a massive impact on your workforce and your income stream. Michael Bird: What are some of the challenges that you come up against with that kind of structure? Phillipa Winter: The challenges really are around those silos. It doesn't matter whether you’re regional, national or local, and that everybody's got slightly different agenda. So what's really key is to really drive that partnership working, so in the locality. But it's also about how big is that elephant and how much can you eat of it. So in a locality sometimes that's easier to manage because you're working in a smaller area you can drive that change and that transformation because at the end of the day it's workforce transformation and that's how that will bring us the benefit - and technology will be the facilitator of that. James Seaman: It’s demographic led as well. The NHS in the past has tried doing national initiatives, national systems, national IT transformation. Having a more demographic focus, a regional focus and having the regional STPs and focusing the local areas to work together and the areas of care and social care - it’s more effective and it's also more achievable. Every touchpoint across the public sector, not just in NHS, is valuable. Michael Bird: Why doesn't the NHS just have centralised IT? What is the reason behind that? James Seaman: There is no single answer to that. It's tried. A lot of people who have worked in healthcare have heard of the national programme for IT, the idea there was to create a small number, not one, but a small number of systems and services for the NHS. There's a lot of complexities in the NHS, you've got all the different areas of care we just discussed, it's a huge organisation so you've got people, process, governance, you've got sovereignty, each NHS organisation has sovereignty over their services, their staff, their organisation as any business would, although they’re not a profit making business, so there's a lot of complexities. Also, depending on funding, so in the new scenario we find ourselves in people will tender for opportunities to provide services to mental health so you may find, for example, with Bolton - Bolton are working alongside a CCG to deliver IT services for that CCG, so there’s an element of competition as well. Also it comes back to that analogy of eating the elephant - when you try and do something of that scale it's a bigger meal to eat, it's more difficult, so allowing the organisations to have that level of sovereignty and being able to go out and source services and deliver services in a way that's meaningful and effective and appropriate for that organisation really is the only way that you can do it. But yes your point is valid - you're from the south if you fall ill, whilst you’re up in Manchester today, there's an element of ‘well I need to be treated and I want the clinicians to know my health care records’, so obviously integration is key and there are a massive amount of initiatives around integrating care and care records and the information but the organisations, and the keyword is they are sovereign organisations, they are independent organisations. Phillipa Winter: But I think what's really key now is that in this different era now is that we've got to really challenge our suppliers on being open and offering that interoperability, and really drive that and that is a national agenda, but it's not easy because obviously they are proprietary and they've got competitive and commercial things that they need to stand up by but that's the only way forward so if you are here and you fall ill, is that we really challenge our suppliers to make that information open and that we can inter-operate that and integrate that into our systems. Michael Bird: I'm guessing from some of the conversations we've just had, there isn't one big central database. Why isn't there one big central database? How does data work in the NHS? Brett Walmsley: That's a big question isn't it? Like you said, it's been tried. There isn't the flexibility and each locale has their own difficulties and their own nuances. Even Greater Manchester there's so many hospitals with their own specialties, their own pathways, their own way of working, their own staff, there’s not the flexibility to have one central system - they tried that, it didn't quite work out as it should have done. Michael Bird: And why is that? Brett Walmsley: Because it doesn't offer that flexibility, you’re picking one system for everyone - one size does not fit all. James Seaman: Clinical pathways are difficult, you can go from here, now to the Phillipa and Brett's hospital and be treated for a condition, but the clinical pathway, the way in which you are received, treated and care is delivered and medicine prescribed can be different for the same condition in another NHS Trust, so a clinician will work differently, and that’s clinician-led. Phillipa Winter: We’re not talking about tins of beans, we are talking about people who have multi comorbidities, so you can’t always use the same pathway, because somebody could be quite different, so what you might need to be something very different to James’ and Brett's needs because of what you've got in your health. Michael Bird: We’ve set the scene for the wider NHS, can we talk a bit about the Bolton Foundation NHS Trust? Is the IT in Bolton different to other trusts? Brett Walmsley: Yes. As head of IT and the CTO, I have a lot of freedom to act and that allows me to be more creative, I think. It actually comes from a historic lack of funding so we had to be creative with what we got so if we could afford the best and the Rolls-Royce of all the systems, we probably would have done it but we didn't so we had to think outside the box and that thinking has just continued as we've grown and it's allowed us to do some very creative things. For example we've been dealing with virtual technology and virtual desktops in particular since 2012 which some see as the last few years as quite new - it's quite old hat, we've got quite good at that which has set us apart. One of the very few, if only one of two trusts in the entire country that using entire infrastructure as virtual desktops. This was born out of talking to clinicians rather than… I say this in some of the talks I do with Phillipa, generally if you give IT people the ability to go and buy what they want, they go and buy the fastest thing they can get, what they think is cool or the best for the money you've given them, and then give it to them, going “It’s really cool, it’s fast and it's really good,” that might not necessarily be what they want. So we flip that around as clinicians and say, “What do you want? What actually do you want as a clinician, as a nurse and a doctor, what is it that you want it to do?” and it’s surprisingly not the same. It's an overlap - they want it quick etc, but it’s not what you want. You want it safe and secure and locked down within an inch of its life - that's not what they want. They want it… and the desktop technology we have has allowed us the ability to move around the hospital without waiting for machines to log on, without having to put passwords in, they can use RFID, like a bank card, to log onto the machines anywhere across the whole of community, not the hospital but in the communities and health centres and just continue when they get home actually where they left off, so it’s a big difference. James Seaman: It's patient-centric and that's the key point. I coin the phrase ‘magpie purchases’ – I’ve been a manager in IT and you buy the shiny - “That's really good technology, I want one of those.” The change we’re seeing across the NHS, to be fair to other organisations out there, but specifically using that example of Bolton’s VDAs, it’s patient centric, so there are services that have been deployed in that sphere and on Brett’s platform that allow clinicians to interact directly with the patient within the patient context, so it knows what bed you’re at. It knows what patient record you want to show, if you want to go through the observations for that patient, they are visible to the patient and the clinician at the same time. And taking that outcome, that patient outcome approach to delivering technology, VDI is not unique, full stop, certainly not in the public sector, but the way it's architected and delivered and the outcome to the clinician, to the patient and the overall service, that is. That’s certainly my approach to our public sector customers, to look at the patient's citizen outcome, and you wouldn't necessarily think that with something as ‘mundane as desktop’. But actually every facet of service needs to be patient centric and patient-focused. Phillipa Winter: I think what changed in this country was the review done by Bob Watcher. And he’s done a really great book which is an easy read, called The Digital Doctor. But what he did, he did a review for NHS England and it was making IT work, harnessing the power of health informatics and technology to prove care in England and that was around inter-operability, user-centred design, clinicians at the front of everything, because at the end of the day, like you say, it's not about shiny kit. It's about what is it going to do to you to make that healthcare better for that patient, or for that user, which is the staff, so they are absolutely key and that's one thing I think we do really well at Bolton is we've got that real synergy between our workforce and technologists to really drive what's right. James Seaman: And appropriate. I think that’s my favourite word as well because I know you guys have done it out of necessity with your budgets, but I think something else that’s sometimes missed by pure play technologists - it’s around what's appropriate for the task at hand, so if it meets the clinical need, the most appropriate solution is the one that meets that need, meets the patient, or the clinician or the business outcome at an efficient price point. Phillipa Winter: And I think what's really good with Brett, which I’ll let him explain, but it's about sweating that asset, and it's not sweating it for eight years, it's about absolutely using every piece of that technology and I'm sure you can go on more about that Brett. Brett Walmsley: Yeah I like to get my money's worth. So when we design something it's meant to be scalable and used. We build the relationship and partners with people like Softcat and other people we work with to make change, make it NHS centric because we fight against the big private sector about what we want, and our technology is really important to us, it can make a difference between patients. So I like to get my money's worth. Michael Bird: And how do you do that? Brett Walmsley: So we find flaws, we find improvements and features and we sit down with them and say, “It would be better if you added this, this and this into your system and then if you did this other organisations, particularly Trusts would find it useful.” So we give that development back to them, so we develop it ourselves and say, “Here you can have that for free, just give it to the rest of the people who have this software,” and just keep going and going. James Seaman: You mentioned the design as well, Brett, and I think we were having a conversation earlier today around banking sectors and organisations that have these risk registers that say ‘when our systems are down it costs us x amount of millions of pounds per transaction, per hour if we can't effectively use our IT systems,’ so banks and stock markets and large-scale commodity organisations will understand how effective IT is and how much it can hurt their business when it's not available. Healthcare, it’s people, it's not beans, as Phillipa said, so a GP can't see you if the GP practice system isn't live, so from a commissioning perspective, the GPs who sit within the CCGs, they are beholden to IT, there’s very little they can do if they can't access your patient record. In an acute space, IT drives MRI scanners, IT drives pathology systems, IT drives systems that rely on for results and prescribing. There are elements of AI in things like electronic observations to tell that you’re deteriorating, so a nurse can input something every 15 minutes - they don’t need to know the impact of the information that they're putting system, but the system can say your temperature’s dropping or your blood pressure’s rising, and can alert someone to that. So the design is key, so to be able to deploy something and transition isn't about buying something that’s shiny and buying the best, it’s about understanding the impact of change as well, so when Brett, again not wanting to big Brett up too much, but architecting systems like a desktop service allows you to transform, release new features, upgrade, patch, reboot, fix without impacting the acute hospital services is also key and that's not just about BAU, business as usual, everyday stuff, it's around planning for the unknown, in five years what are we going to do with my servers expired, what are we going to do when that licence expires, what am I going to do when that product’s no longer viable? The design is key. And I think Brett needs to take accolades, and there’s other colleagues in the NHS that do the same, around that design element, because it's not about losing money, if the system goes offline. You can't treat people. And I think sometimes that's forgotten. Phillipa Winter: It is but it's also about safety. So I think one of the things, I don't know if you're happy to discuss, is about the piece of work that you did recently around the tap on the mobile device because that's absolutely key - that’s a piece of work that Brett did. So if you think about governance and about putting somebody’s observations into a mobile device, which is great because you've not got the human error of adding something up wrong so it's really safe from that point of view, but also if you pass a mobile device to the next nurse and you've not logged off then it looks like that nurse has put that observation in, so it's really key we know who's putting those observations in for health and safety and for quality reasons. Michael Bird: What's the technology, can you talk about it? Brett Walmsley: Yeah it happens a lot in the NHS, in IT, where there can be a separation between wanting the clinical system and then actually making it work with the technology that you've got, so the system they do all the obs and it’s absolutely brilliant, but how you deliver it makes it a success or not, because you don't want technology to be a barrier. Suddenly they scribble on a piece of paper what the obs were, now you are giving them something to walk around with to charge, to log on to, it takes more time and, believe me, I've been told many times, a few minutes from the clinician’s time is absolutely valuable, so I didn't want that. So this system came along and said we need 500 devices please and my job is to say, “For what?” “Well it’s ok, it’s a web page, we’re just going to put the obs in.” “Well how are they going to log on?” “Well they’ll just log on.” But can you imagine, give them an iPad every day, or tablet or Android and having to open it up and log on to it with a big password, it's just going to turn people away, it’s going to become a barrier and I didn't want that. So I got in contact with one of our suppliers that use the tap technology and said, “I don't suppose you got anything that works with an Android?” the answer was “Not really, we’ve looked at it…” So long story short, we had a conversation, brought the programmers in from around Europe, sat down for a week, for a few days and developed the system that would use the tap from the user from the desktop onto a mobile device, so they just tap on the back like you would with a bank card, login is done. So you can pass it to someone else, it switches to the next user, so they can pass it to someone else and it takes a few seconds, and there you go. So they take that away. The best thing I ever got was when we’d actually deployed this to the first ward, said to the nurses and the consultants, “Here you go, use this,” tapped on the back and went, “Yeah, that’s fine,” I thought, I'll take that, I'll take that. Michael Bird: It’s like being a goalkeeper isn't it, you kind of don't want them to say anything. Phillipa Winter: And that's what my boss says, if it's no news you're doing a great job. Brett Walmsley: I suppose that's where technology, this is the, I love the part in the NHS and the colleagues work in IT is you really can make a difference to patient care, even though you're in IT. It's got to be unique in the world, hasn't it, to get out of your bed in the morning, if your technology means that someone has to wait for 10 minutes to log on to your machine… I mean, if you open your laptop today if it took 10 minutes a log on it would be an inconvenience. If that was a consultant that had to wait ten, fifteen minutes, that’s a patient he’s not seeing, and that’s what you've got to think about when it's citizen, patient friendly. Part of the technology you probably don't think of in hospitals is entertainment. We're obliged under the patient charter to provide entertainment. Michael Bird: So a bit like in-light entertainment? Phillipa Winter: You've got to offer TV. Michael Bird: Do you really? Brett Walmsley: It's part of your… I wouldn’t say it’s legal, but it’s about as close as it gets. We got funding from NHS Digital, as part of this five year forward that the government centrally provided funding to give patient Wi-Fi. It's called NHS Wi-Fi, you'll see it in your GP, you’ll see it in every hospital. So we got money for that, and I don't like tick box exercises, which I think infuriates lots of people, so I don't like to go ‘yes we've done Wi-Fi, tick, that’s done, move on to the next thing. I was thinking, ‘what else can we do with this money? What else can we do this technology?’ So I started looking at something that frustrates me is the patient entertainment system - currently it’s a national programme and one contract that started about 15 years ago. If you ever go to hospitals, most of them, you'll find these huge arms that come across the bed and it's all this outdated and needs to move on but the problem with that is funding it because it kind of funds itself so the trust don't really get involved in it. So we decided that we would look at that what we could do with that, so I started work with a company that provides the Wi-Fi for the majority of hospitals about creating a new modern patient entertainment system, something for the 21st century, and what we found is if you go in to hospital and you find the most people have their own devices - they’ll have an iPad or tablet or a laptop, so do you really need all these arms? Do you need to provide all this technology for someone who's got their own? So we wanted something that you can bring your own device and watch TV on it and watch your Netflix. In bed watching Amazon or Game of Thrones or whatever it is you want to do, so we used that technology, the Wi-Fi, to provide this proof of concept for a streaming service which was free, but then we took that free service and then hooked it up into a telephony system which provided free phone calls. So it's about taking what was just a Wi-Fi project and suddenly now we've got a project for people to stream media which is the modern way to watch TV. Then we’ve even taken that further, we’ve got these bedside side screens can also use our desktop technology, so you could be watching Netflix and the consultant comes along at the back with his smart card, taps on the back and use the Eobs system, tap back off and you go back to Game of Thrones, all from just taking Wi-Fi money and taking it to the nth degree. And it's something I'm really excited about in Bolton that can be picked up and blue printed and used anywhere that wants to use this technology, it’s been designed so that you can just provide it as a service so the patient shouldn’t have to pay for that, they shouldn't be in there are worrying about telephone bills or connecting with their loved one. These tablets we have, they have Skype on, so you can have a telephone conversation. Michael Bird: We’ve talked a lot about how Bolton Foundation NHS Trust has taken advantage from loads of technologies and developments; can we talk a bit about how other NHS Trusts can take advantage? Are there other things in place now where you can share ideas, you can share concepts? Phillipa Winter: In the North we've got a really strong network with the Informatics Skills and Development Network which is Liverpool, Cheshire, Greater Manchester and up into Cumbria and Lancashire, so there's an absolute want there to share that best practice and learning cause why, again, in public services are we all doing the same things wrong? We need to be sharing what's right and what lessons we've learned and what was hard and failed and failed fast and tell others how we've done that, so that's absolutely key, but also I’m part of the digital academy which I think is another thing, so Brett has supported some of my peers on the digital academy so that's come from NHS England around informatics leaders and again, how we share practice, how we network and how we do that across the whole of the country really. And Brett, through that, has helped other people down south and it's really about understanding what's out there and that blueprinting. Michael Bird: So what about outside of healthcare? Do you collaborate with other organisations? Do you learn from other organisations? Brett Walmsley: Yeah actually this year I've met with several big companies in Manchester that came to discuss security technologies. One of my past lives is security based so I'm quite infamous in my organisation for saying, “No. What did you want?” I’m very security conscious. Every now and again I’ll contract, just to see what the other side’s doing, to see if there's anything that I'm missing out on. You’re probably gathering, it's a different beast. People may be listening thinking, “Why haven’t they got one system?” You wouldn’t get Tesco having every single branch having a different system and then trying to talk, it seems a bit odd, doesn't it, so I like to see what's out there. So we do you talk to other people. They have the same problems, they just don't have the same impact, I don't think. Michael Bird: Do you think that there’s an organisation that's not in the public sector that’s on a similar scale, or similar complexity to the NHS? Brett Walmsley: Can you think of one? I'm not so sure, we were talking about financial institutions on the impact that can be measured, on the stock markets, seconds matter - billions can be wiped off, but on that scale…? I struggle to think of the uniqueness of the NHS. Michael Bird: So what does the future look like for technology in the NHS? James Seaman: We’re on the verge of an NHS app being released through NHS digital for patients and their ability for them to access their information, it's driving a much more connected health space and what I mean by that is connected from a patient, from a citizen perspective, so in the same way that I can sit at home on a Sunday in my underwear on my sofa and book a holiday on my phone, I’ll soon be able to have a similar experience, if the data is readily available, to be able to access my care record and any appointments I've got booked, or contact a GP. We’re verging on a much more interconnected healthcare space. There's some national initiatives around, as I said, the open standards which gives the ability for more effective delivery of care services from an IT perspective, what I mean by that is removing the stranglehold from the independent software vendors, the blue chips that are delivering these end-to-end systems that are very expensive, very costly to deliver - open standards will allow us MEs and disruptors to come into that market as well, so it's quite an exciting time, and it hangs around the user centred design, the citizen focus - how it's going to be used and what it’s going to be used for. Michael Bird: So this app and user-centred design, why are they doing it? What's the benefit to the NHS? or has it come from the government down? Phillipa Winter: It has, but at the end of the day it's about empowering the citizen to be able to take control, like James said, we can all do our banking, we can all book, we can do everything apart from manage our healthcare, which is absolutely the same for us all. But if you look at Matt Hancock who's our health minister and about what he wants to invest, he’s said 20 billion long-term plan to improve health and care, now that's not just all about technology that's more about how we change and how we evolve and if you look at that it's about the culture because at the end of the day if we've got a problem it was still be a problem, it’ll still be a problem if the people don't adopt that, so the only way to change that is by doing that user centred design, which is absolutely key. At the end of the day, the data is the citizen’s data. Why are we proprietor with other people’s data, that’s not right, so I think the future is bright, I think there is money there that will be invested into that but we've also got to win the hearts and minds of our users and to do that is by the core design and the user design, that's the only way forward. Michael Bird: So can we look a bit further forward can we maybe look 10, 15, 20 years ahead? How do you see the NHS and the wider technology of the NHS has? How does that look maybe to someone like me who the only interaction I would have with the NHS is when something goes wrong? How does that look to me and maybe how does that look to a healthcare professional? Brett Walmsley: We tried to do that, but we were looking at, as much as a year or two years ago, patches you would put on and they were wireless and they would send the Eobs directly to wireless access points and directly into your patient record so you didn't even need a device, but they were just too expensive. So it's not pie in the sky or Star Trek, or Elysium, it is available, but as everything else, it'll get cheaper and the more it gets cheaper we should be jumping on it or innovating with it, because I would love to have done Eobs with the disposable patches. Brett Walmsley: 10, 15 years, why not? Phillipa Winter: I think with AI and robots, I think we’re in for a different world totally, but as a clinician you can never take away that human, and I think it's key to say that, that you will always want the softer side, you'll always need that because there's always the nuances because we aren't dealing with a tin of beans, we are dealing with humans here. But I think it's the synergy between the two about how we can have a digital workforce that absolutely supports the growing need because at the end of the day we are out stripped from that need. There isn't the money so we have to do something clever and intelligent. Actually having a digital workforce using robots, using chatbots, using AI will absolutely help that clinical workforce work differently and to transform. Michael Bird: So James can you provide a bit of a summary? James Seaman: We’ve covered the history of the NHS and where it's come from, its structure right through to what the future looks like and the pain points and the elements in between. I think we've had a really good view from Bolton and the challenges that Bolton has faced, how they've overcome those and what the opportunities are moving forward. The things that excite me around, if you look at where the NHS has come from and how it’s improved and continues to improve and become more self-aware so we are aware that innovation needs to happen, has meant that we can be more proactive. I hope that's resonated through the conversation and that this is not about ‘aren't things bad’ or ‘look how good we are’ it's about actually an organisation that I’m proud of, the NHS, becoming that self-aware entity to know that it needs to innovate and areas to focus on. And I think it’s interesting and hopefully interesting for people to hear what's been achieved at Bolton and what those opportunities are. It’s not about the tech, necessarily, the technology or vendor that Bolton have selected, it's more about the function and the outcome for the patient, that user-centred, patient-centred design of service, right through to what the future holds, so some of the things that are being done nationally and from my perspective and my role from Softcat is to have those conversations with customers, to challenge the more commodity focused ‘I've got some money, I want to buy some desktop PCs,’ or ‘I've got some money, I want to buy an application,’ to actually say, well I talk about the Holy Trinity in the public sector around the citizen, patient, student, whichever area of the public sector it is, in this case patient, the staff, the stakeholder, the person delivering the care. And then the organisation, and the organisation is twofold, it's the Trust, in this case Bolton, but also the government and if it's Wales and Scotland it’s slightly different, but the actual national body. If you're making a change, an investment, it needs to impact all three, or at least one of them, otherwise why do it? Don't buy desktop PCs because there's money to buy desktop PCs unless you can have a measurable outcome to one, if not all of those three areas and my role, if you like, at Softcat is to work with customers like Bolton who understand that, and understand the history, understand the current position but also understand what the opportunity is and have that citizen, that patient, that user-focused approach and outcome. I was quite excited about doing this podcast and getting the guys in from Bolton because it's really interesting for me and hopefully for other people to listen to what the challenges are in the NHS, what the supply chain, Softcat included, are trying to do to help and facilitate that change and what the opportunity is, because at the end of the day we might work for Softcat, we might work for an ISV, we might work someone who’s delivering services, product, people whatever that might be into the NHS - might work for the NHS - but it's our NHS, so actually just because I'm supplying something to the NHS, I still use it and I'm still proud to use it so we need to do it in the most effective way. Michael Bird: Well James, Phillipa, Brett, thank you so much for your time, it’s been really interesting hearing about your experiences and just hearing a little bit more about the NHS, so thank you so much for coming in. Listeners, if anything in the show has piqued your interest, or if you'd like to speak to someone at Softcat about anything we've talked about in this episode we’ll be putting some contact details in the show notes, plus also we’ll add to the show notes some of information about some of the stuff we’ve talked about day as well. Please also make sure you click subscribe wherever you get your podcast. So you’ve been listening to Explain IT from Softcat, thanks for listening and goodbye.